When visiting France, you have the perfect opportunity to enjoy flowers as those who walked on earth before you did – one quite famous person, in particular. In France, you can head to the Fondation Monet at Giverny, a magical destination where guides will show you Claude Monet’s stunning garden and help you understand the impact that flowers had on the leader of Impressionist art. Monet’s Garden at Giverny is a special place, as you’ve likely noticed in the artists’ paintings. In this garden, there were (and still are) Japanese bridges, water lilies, and much more gloriousness. When you visit the Garden, you’ll have the chance to cross those bridges and stroll around the lilies. You can also take a look at the changes in the sunlight in the garden (and the reflections on the water’s surface) that inspired Monet to paint his stunning creations. Walk across the Clos normand, which is the colorful flower garden that blooms from spring to fall, and imagine what Monet must have been thinking as he landscaped the area according to his sense of perfect composition, color, and perspective. Ramble through Monet’s Garden and view an authentic house that contains the artists’ first studio (which later became a smoking room), Monet and Alice’s bedrooms and bathrooms (they had separate ones), the artists’ blue-tiled kitchen, and Monet’s yellow dining room with extensive collection of Japanese woodblocks. Monet’s Garden at Giverny is a spectacular spot to learn about Monet’s painting and his family life. And, it’s a glorious place to see some of the most beautiful combinations of flowers you’ll likely ever witness. 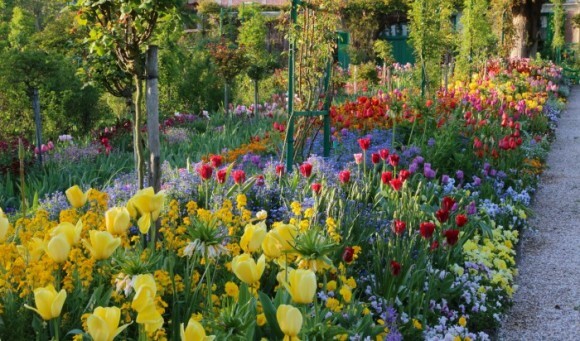 To learn more about Monet’s Garden at Giverny, and to view days and times of tours, visit the Fondation Claude Monet website.